What Are The Benefits Of Horsetail (Equisetum) ? Field horsetail tea made from these herbs are called horsetail. Horsetail (Equisetum) have been used by ancient Romans and Greeks in medicine as a herbal medicine to cure tuberculosis or kidney problems, to stop bleeding, to heal wounds. This plant is actually a non-flowering herb in parts of Europe, Asia, Middle East and North America. Horsetail is a natural source of vitamin C and niacin, along with some important minerals like silica, potassium, calcium, aluminum, sulfur. Horsetail herbs, a natural antioxidant, are also contained in a range of active ingredients, including fiber, protein, alkaloids, flavonoids, phenolic acids, collagen and more. Horsetail herbs can fight against the damages of free radicals because they contain antioxidants. Antioxidants that prevent cancer and organ damage also help to alleviate pain by reducing inflammation. The cancer has spread to other parts of the body. Resist the invasion of foreign pathogens that may endanger the immune system by showing antibacterial and antiseptic properties. 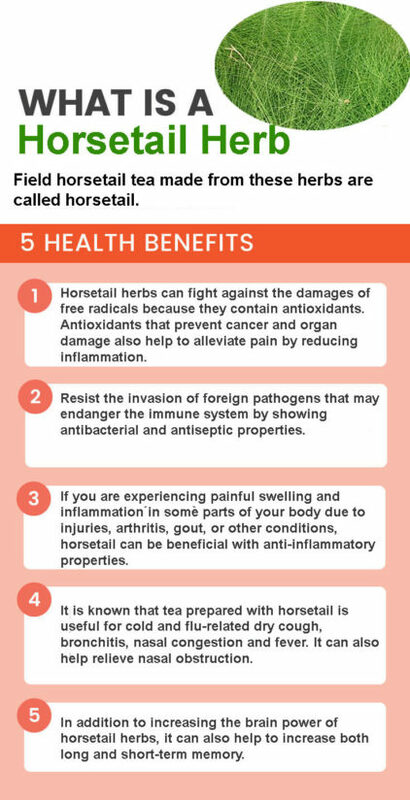 Horsetail herbs that strengthen the immune system that are weakened to protect from diseases or to accelerate the healing time of the disease can be very useful. If you are experiencing painful swelling and inflammation in some parts of your body due to injuries, arthritis, gout, or other conditions, horsetail can be beneficial with anti-inflammatory properties. The analgesic and anti-inflammatory compounds present in horsetail herbs provide rapid relief of the symptoms. 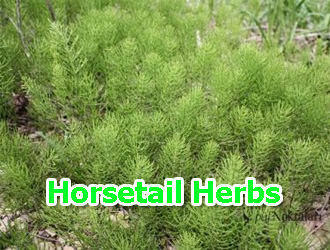 In many studies horsetail herbs have been proven to help with bladder and urinary tract problems. In particular, it is very useful for urinary tract infections that create a constant urge to urinate Horsetail herbs that you can use as both capsules and tea water will help alleviate these symptoms. Studies conducted by UMMC have shown that horsetail prevent kidney stone formation because it helps to dissolve stones. Some kidney stones can develop due to uric acid in the body. Especially tea made with horsetail helps to remove uric acid in the joints and kidneys. This herb is useful for people with gout disease. In studies conducted, patients with type 2 diabetes who consumed horsetail herbs on a daily basis experienced significant blood glucose depression even within an hour. For this reason, you can try to get horsetail of essence once a day, especially after meals. As always, you should consult a doctor before trying this treatment. It is known that tea prepared with horsetail is useful for cold and flu-related dry cough, bronchitis, nasal congestion and fever. It can also help relieve nasal obstruction. For coughing and other respiratory problems, you can drink horsetail or two times a day a horsetail of herb tea as a remedy. If the symptoms last longer than five days, you should consult a doctor. Studies have shown that due to the coagulant and haemostatic activity of horsetail herbs, it can be effective to minimize internal or external bleeding as well as to stop excessive menstruation. It can also help relieve inflammation and discomfort caused by inflamed wounds and menstrual cramps by anti-inflammatory agents. To do this, you can drink horsetail 2 or 3 times a day. In addition to increasing the brain power of horsetail herbs, it can also help to increase both long and short-term memory. The antioxidants that are contained in horsetail herbs are considered as the right choice for health in a brain. Osteoporosis, has become a major threat in recent years. Horsetail herbs can be effective to prevent this condition. Horsetail herbs have high silica content and silica is vigorously needed to protect the cells in the bones. The increase in silica production can increase bone density and reduce the risk of bone degeneration. If you suffer from brittle nails, you can soak your nails daily with horsetail herbs or extracts. This application strengthens your nails and eliminates the formation of white spots. Just keep 10 minutes is enough to see the benefits. Silica in horsetail can be effective for hair growth and health enhancement. Alopecia areata is a type of hair loss. Horsetail herbs can help you to drink tea or add the essence of shampoo to strong, finger-fed hair. Studies have shown that horsetail herbs are bactericidal, anti-inflammatory, antiseptic and silica. At the same time, the antioxidant ingredients can be useful for the treatment of wounds, burns, burns, skin lesions and acne. Silica helps the formation of collagen which is important for connective tissues. As a result, horsetail herbs serve as wrinkle prevention and anti aging. Horsetail tea, more than a freshly brewed medicinal tea, humbly offers a wide variety of important nutritional values. Beneath its many herbal teas, horsetail herb teas also offer a great wealth of positive qualities. • It’s has been used for many years to treat urinary tract infections. This tea acts as a diuretic and encourages the body to flow urine; it helps remove excess water and waste from the system. • If you suffer from weak lungs or respiratory diseases such as bronchitis, tuberculosis or asthma, you may want to consider drinking tea with horsetail herbs. • Because of its diuretic properties, horsetail herb helps to store minerals instead of throwing them away from the body. • This herb help to slow the spread of cancer cells when consumed on a regular basis, because they contain high antioxidant and bioflavonoid. • Known antimicrobial activity of horsetail herb tea protects the body against allergens and viruses. 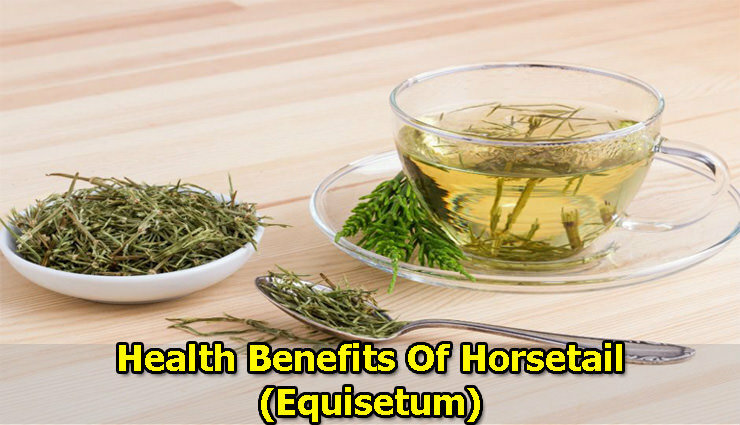 • In some clinical studies, the consumption of horsetail tea has proven to be beneficial in relieving joint and muscle aches caused by some inflammatory conditions such as rheumatism, gout and arthritis. • The mouthwash made with horsetail of tea or extracts can help to bleed in inflamed tonsils, mouth sores and gums. • Help stop the blood and alleviate the pain by interfering with hemorrhoids and pain caused by hemorrhoids due to its anti-inflammatory and haemostatic activity. • Studies have focused on the lack of silica in the body can lead to memory loss. • Antioxidant and anti-inflammatory, help delay the signs of aging by increasing connective tissues. Probably considered safe when consumed by thirty mouths. Thiamin may lead to tiamin deficiency due to its chemical content that neutralizes the substance. Pregnancy and Breastfeeding: If you are a pregnant or breastfeeding mother, there is not enough reliable information on the safety of consuming horsetail herbs, so it is advisable to avoid using them to stay on the safe side. Alcoholism: Alcoholics are usually in people with tiamin deficiency. In this case, taking horsetail can make thiamin deficiency worse. Diabetes: Type 2 diabetes is the most common type of diabetes in the United States. People with low blood sugar should control their blood sugar levels in the event of horsetail herb consumption. Low Potassium Levels (hypocalemia): This herbs can cause low potassium levels. If you have low potassium values, you should use horsetail herbs carefully. Low Tiamin Levels (tiamin deficiency): There is a concern that this herbs can make tiamin deficiency worse. 1. Capsules: Should be used as a standard dose containing 10% or 15% silica. 2. Herbal infusion (tea): It is recommended to drink 2 or 3 times a day if it is brewed for 5 or 10 minutes with 2 or 3 teaspoons of hot water poured over the herb. 3. Tincture (1: 5): You should consult your doctor for the proper dose. 4. External (compresses): 1 liter of water per 10 g of keel herb can be applied daily.